Everywhere you look there are cats. Rubbing alongside the cafe owners each has their own little territory in the shade. Some have food left out for them by a friendly human neighbour. Moroccans hate to waste food and any scraps are left out for the birds and any cats or dogs who may find the morsels. They have also learnt the best shops to loiter outside. The butcher will have scraps, the cafe will have scrag ends from a plate. Others have learnt the art of begging. Appearing from nowhere as your food arrives at the table they have mastered the longing look, silently sitting patiently waiting, knowing that the humans will eventually relent and provide an offering. 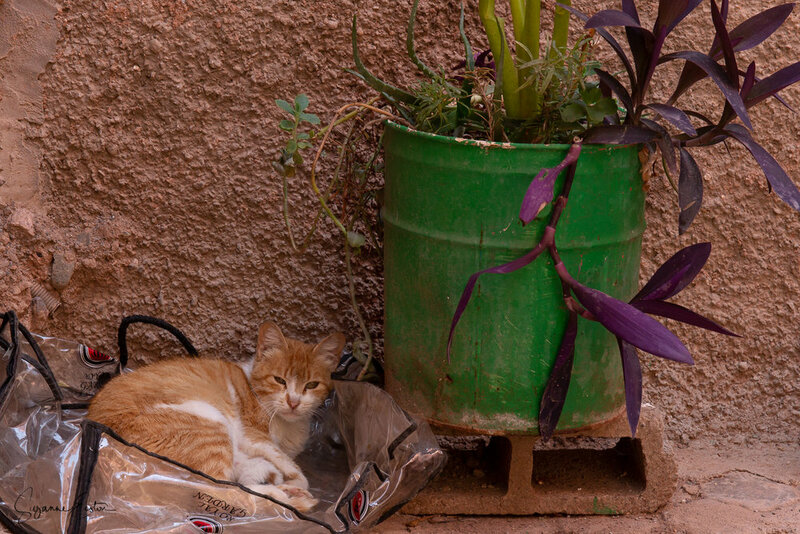 Why are there so many street cats in Marrakech? Neutering animals is not a high priority in Morocco. In many countries where cats are a part of the family, neutering is a routine procedure carried out when they are young before they are really ready to start to think about the fun they can have with another cat. Finances play a huge part in the process as well. There are usually more pressing needs for limited funds in Morocco. Traditional Islamic belief plays a part as well. Many locals believe that God will provide for all living creatures and that if God has provided life then it is not our decision to interfere with nature or take away the cats chance of being a parent. 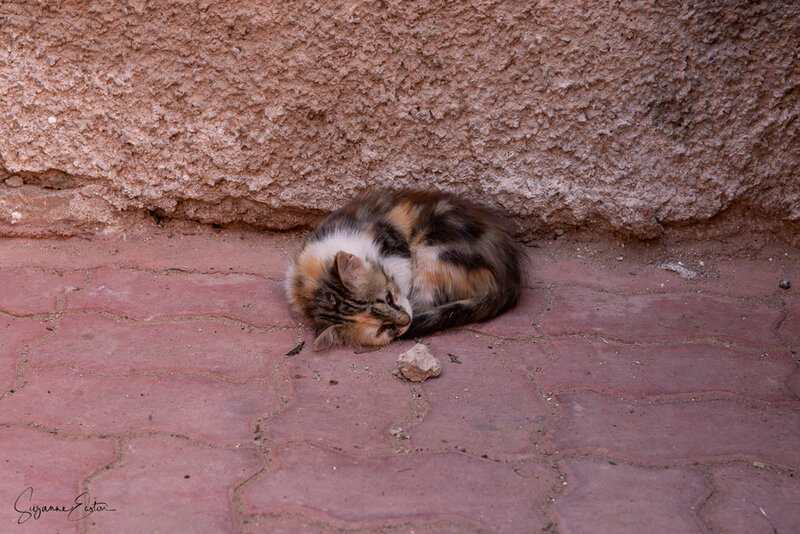 Things are slowly changing and people are starting to see how a neutering programme helps the lives of street cats and the population of cats as a whole, but as with everything it takes time. Do these cats need help? 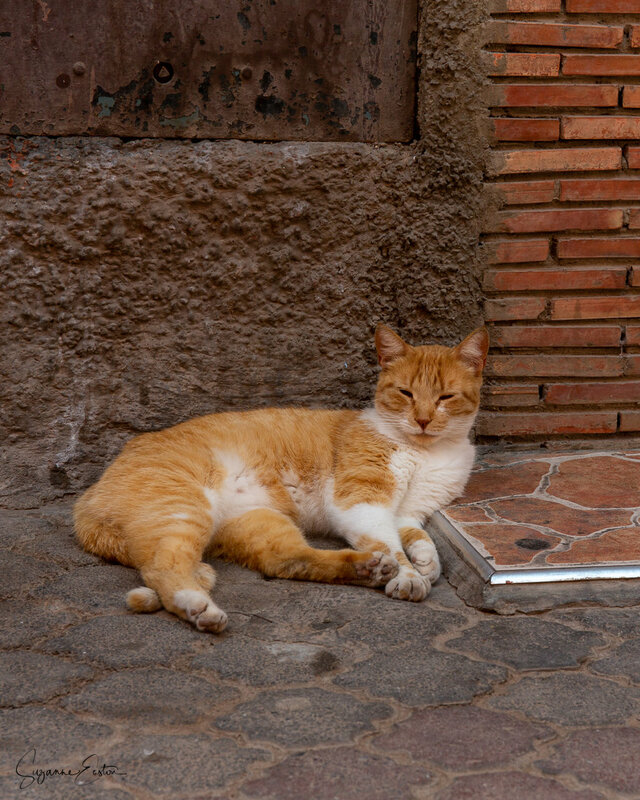 The cats on the Marrakech streets range from plump and content to mangy and malnourished. Some hang back when food is on offer, missing out time and again. Some are seen off by restaurant staff who see them a pests. There is however a plentiful supply of food available and a good bin raider appears to be able to survive quite well. The biggest danger to these cats is injury from vehicles. Scooters zip around and near misses are a daily hazard for these felines. 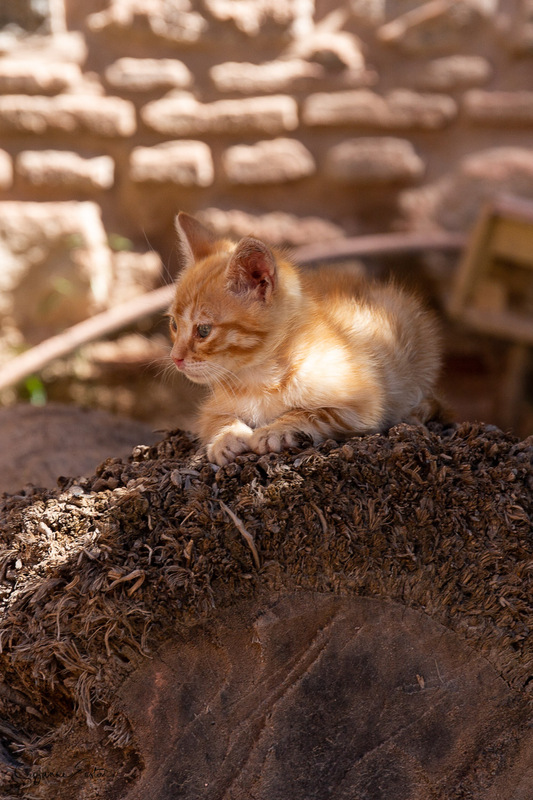 Whilst the temptation is there to pet these cats (and they enjoy it if your drop your guard for a moment) they have fleas, worms and parasites, most are unvaccinated and whilst rare, rabies is present in Morocco. A bit of an invisible minefield really! So do they need tourist help; probably not - the balance of care is adequate and whilst not seen as pets, many are cared for from a distance by the locals. Lots of shops have their resident cat who has chosen to make their home nearby and will provide mousing services in return for a warm and safe corner with a top up of scraps from time to time. The perfect arrangement if you are a cat! However, as with many places a structured and funded neutering and vaccination programme would improve the lives of many semi-feral cats in the city.